The N.C. Chronicles. 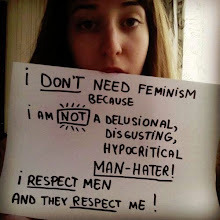 : Act like a man, be treated like a man, that's real equality, feminist style. Act like a man, be treated like a man, that's real equality, feminist style. Woopi Goldberg said; "If I slap a man, he has the right to slap me back". Here is a little piece of reality, you want to be equal to a man, some will take it literally, as we see in the video and will be treated as such in courts, as in self defence, is this what we want?. Equality has it's limits, it's balance, doesn't mean you can go around hitting a man and think because your a woman he won't "defend" himself. Feminist equality equates to, you hit a man, he has the right to hit you back...this is what they want, isn't it? First of all; "WE DO NOT CONDONE HITTING SOMEONE WHO IS PHYSICALLY WEAKER THAN YOU", whether this be a man or a woman. There are other way of controlling the situation other than violence of this kind, personally I would have sat on her, but that's me. Equality for women means, equal opportunity, equal pay, walk the street safe, be treated like a woman, on and on...these rights will be protected and defended by the gender who is stronger physically, doesn't mean women are weaker, or need to be "controlled", it simply means we all have a place in the circle of life and to respect it, find it's balance, benefits us all, especially our daughters, (and sons). Be who you want to be, we all support this, but for f*ck sakes, there are limits and balances that must be followed. Men and women. We all need each other, one cannot go it alone, we are all a strand in the web of life.